Perfectly designed in every detail, luxury charter catamaran Sunreef 74 BLUE DEER is a real manifestation of the finest Italian taste. Her interior and exterior design are an expression of the most sophisticated elegance aimed at delivering an unforgettable experience aboard to guests. The interior is the result of a passion for design, arrangement and exceptional craftsmanship. 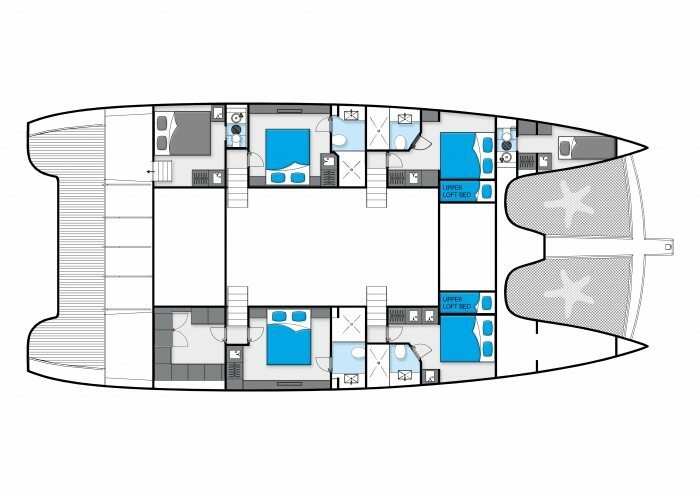 The open saloon with a panoramic view and interior navigation station equals over 35 sq. m. Additionally, there is a galley up arrangement in which preparations of the most delicious specialties for guests will be expertly executed by the chef. The lounging area in the saloon comprises a comfortable U-shape sofa set made from natural – grey fabrics, foldable table and sliding tv straight from the kitchen countertop. The yacht can accommodate up to 10 guests in four separate spaces in the hulls including 2 standard aft cabins and 2 VIP cabins, each of them designed to the smallest detail to bring comfort and pleasure. In the VIP cabins are decorative elements of painted trees and silk in grey, pale brown, raspberry pink and navy blue colors. The cabins are equipped with comfortable king-size beds, wardrobes and retractable TV’s. Each guest cabin comprises two single (convertible) beds and an upper loft bed that is ideal for children. Their designs incorporate aquamarine, raspberry and noble shades of grays and silver colors. Each room has its own ensuite spacious bathroom in white Lava Rock and gray glass mosaic finishings. For charter of less than one week the daily price will be the weekly rate divided by six; this daily rate will be multiplied by the number of days (minimum 3) based on the lenght of the charter. For charter of less than one week the daily price will be the weekly rate divided by six; this daily rate will be multiplied by the number of days (minimum 5) based on the lenght of the charter. Mediterranean weekly and daily rates do not include APA (Advanced Provisioning Allowance) which should be sent together with final payment for charter. APA represents 20% of the charter total amount. Mediterranean weekly and daily rates do not include VAT, which, depending on the cruising area. be sent together with final payment for charter. APA represents 20% of the charter total amount. Mediterranean weekly and daily rates do not include VAT, which, depending on the cruising area.